First I'd like to welcome my new followers. Welcome!! I always check out new blogs and websites and am thoroughly enjoying my online community! 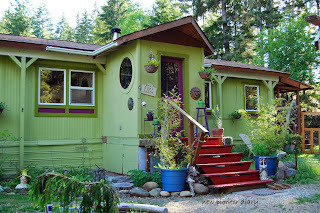 This post is dedicated to my gratitude to Crystal at Mobile Home Living for her superb two part feature on my place. She's a sensitive and intuitive woman with a real talent for showcasing others. I wasn't just impressed with her detailed "reporting" about the improvements to my place, but more so her keen observations of my mission and what I'm about here. With just a brief interview she really zeroed in on the totality of my lifestyle. I appreciated her professionalism and use of my photos to tell the story - complete with link backs to my posts! So I guess this is sort of my public thank you to her, but I also really want to encourage others to check out her blog as well. Not just the article about my place, but all the features she has done. There's a ton of really useful tips and information on mobile homes and wonderful images of remodels and makeovers. Thank you Crystal at Mobile Home Living and thank you followers for your interest here at New Pioneer and for your blogs and sites as well. I've just been over to mobile home living to read your feature. I love the Retro Retreat, you've created such a beautiful haven, inside and out and it's inspiring to read more about it. Congrats on being featured. I'm headed over to have a look. I always enjoy your blog. Have a wonderful week!